Porsche has made a name for itself as a no holds barred emotional experience for those with an appetite for power, precision and performance. In recent years, however, the company has been shifting its weight from performance to mainstream with the introduction of their first SUV, the Cayenne, and more recently, the four-door Panamara. While to many diehard Porsche fans it may have seemed like Porsche was growing up, leaving its more focused approach to automotive design in the past and opting instead for larger sales and production numbers, we would like to assure all those wringing their hands, this is not the case. 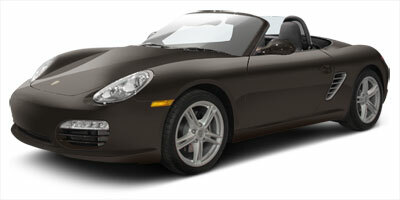 Those seeking tangible proof need look no farther than the 2011 Porsche Boxster Spyder. The better question is, what’s not to like? Everything from the red seat belts and door pulls to the silky 3.4-liter flat six-cylinder engine seems spot-on for a car of this demeanor. 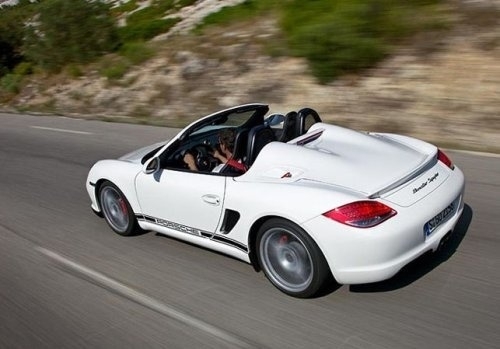 â€¨The Spyder is a Boxster S on a weight-shedding regime, the perfect iteration of the storied Boxster lineup. â€¨As with any Porsche the options list, the potential add-ons are nearly endless and add up quickly. Adding air conditioning may be tempting, but will increase curb weight. â€¨We opt to keep it light and stock. 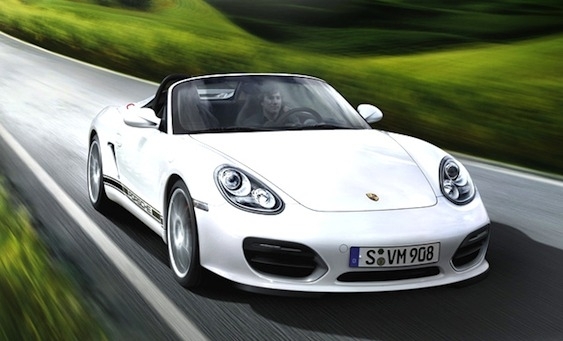 Imagine a Boxster that’s been training and on a weight-cutting regime – lose the weight, add the muscle. Like a fighter into the ring, the Spyder takes everything you love about the drive of a Boxster – the slinky gearbox, the power and lithe engine, the roadster feel – and pushes it to the tenth degree. As a plus, to accompany this extreme makeover, the re-jiggered Spyder brings with it 10 more ponies and has a more aggressive stance that’s 20mm lower than the standard Boxster S. There is no roof – just some basic canvas and carbon fiber you’re not going to want to ever install – add to that the Carrera GT-esque flanks that evoke a feeling that, when the times comes to mash the throttle, the power will be there. We prefer to call it the ECP, or Emotional Control Peddle. Throttle angle seems directly linked to a feeling of how things were ‘back in the day,’ when cars were light and drivers were heavy. This Boxster Spyder is the reason the phrase ‘weekend car’ was invented. It’s perfection on a diet. The 3.4-liter flat-six found in the Boxster S gets a bump from 310 to 320 horsepower, with 273 lb-ft of torque at 4,750 rpm. The Spyder puts down its power through either a near perfect six-speed manual or Porsche’s even more perfect seven-speed PDK dual-clutch automatic transmission. Of course, it’s rear wheel drive. When equipped with the PDK transmission, the Spyder will scoot to 60 in a rapid 4.6 seconds, two tenths of a second faster than the heftier Boxster S.
Electronic equipment is sparse in the Spyder, which opts instead for lightweight performance and handling over technological wizardry. All the magic is found in the engine and chassis. Add the Sports Chrono Package and PDK and you get such features as launch control and lightning-quick shifts. â€¨Weight reduction not only improves performance, acceleration and handling, but also improves the gas mileage. While official EPA numbers have yet to be announced, they should come close to that of the Boxster S, at around 19 mpg city and 26-30 mpg on the highway, which for a six-cylinder sports car, ain’t half bad. While the exterior remains unmistakably Boxster, the wide rear hips, integrated rear spoiler and self-described ‘Power Domes’ make the Spyder instantly reminiscent of the Carrera GT supercar. Did we mention that the roof is completely manual and is made up of intricate and well-engineered pieces of canvas and carbon fiber that invoke the feeling of a bikini top on a Jeep CJ-7 and is bolted on with what look like mountain climbing carabiners? No? Well, it’s as awesome as it sounds. Starting at $61,200, the Boxster Spyder has a $3,200 premium over the base Boxster S. With such a comprehensive options list, expect the price to easily climb to about the $75K mark, if you let it. This puts it in the area of other roadsters like the BMW Z4 ($51,650), Chevrolet Corvette Grand Sport Convertible ($58,580) and the Mercedes-Benz SLK 550 AMG ($66,650), but really, there is nothing else quite like it. The most recent release from the boys in Stuttgart is a throwback to what many from the 911 owner’s club would call the ‘good old days’ – the Porsche 550 Spyder. These were the days when power convertible tops and air conditioning were an expensive luxury, if the car had them at all. 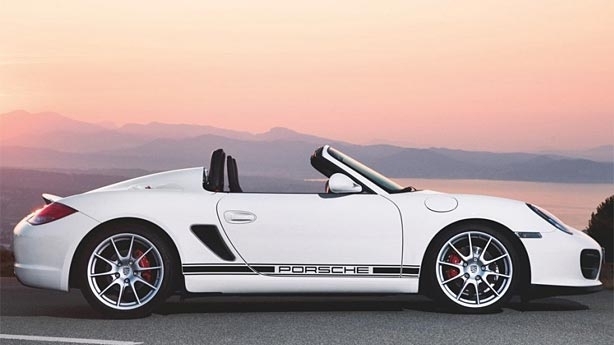 Fortunately for these retro lovers, the 2011 Boxster Spyder is an open-air roadster that is as close to a time machine as you’ll get in a modern car, let alone a Porsche. By deleting everything from the radio to the door handles, this is now the lightest car Porsche makes. Looks mean, drives like hell and is more fun than a barrel of German monkeys. We like it, very, very much.